Listening to your customers is a great way of delivering them a product they want and will enjoy. We recently solicited feedback from our fans on what moments they would like us to capture for the first ten cards in the 2011-12 NHL Biography of a Season set. This set is ONLY available through Upper Deck Certified Diamond Dealers that opt into the program so check with your shop today to confirm they will carry the set. If they are unaware of the promotion, they can check with our Authorized Hobby Distributors for information on the set. There will be a different card available as a gift with purchase to hockey fans for each week of the hockey season starting in November. Upper Deck's network of Authorized Distributors are currently taking orders for this season's set from Certified Diamond Dealers. BOS1 – Tim Thomas – Commemorates his regular and postseason dominance as requested by Upper Deck fans Alex Vegh, Matt, Nate Brown, Gene, Matthew Gilman, John, Nick Graff, Chris Barr and Eric Jacobson. BOS2 – Ryan Nugent-Hopkins – #1 overall pick in the 2011 NHL Draft as requested by Upper Deck fans Brad Parsons, Justin Schnell, Alex Vegh, Jen and Chris Barr. BOS3 – Boston Bruins – Stanley Cup Champions as requested by Upper Deck fans Ernest Hebert, Matthew Gilman, Chris Barr, Gordon Yet, Eddie Ruan, Guillaume Petit, Brad Parsons, Matt and Ian Cavanaugh. BOS4 – Corey Perry – Wins the Hart and Richard Trophies as requested by Upper Deck fans Chris Barr and Guillaume Petit. BOS5 – Nicklas Lidstrom – Wins the Norris Trophy as requested by Upper Deck fans Ernest Hebert and Justin Schnell. BOS6 – Jeff Skinner – Wins the Calder Trophy as requested by Upper Deck fans Jen, Mike, Chris Barr and Kevin. BOS7 – Jaromir Jagr – Returns to the NHL as requested by Upper Deck fans Brad Parsons, Gene, Chris Barr, Nick and Brian. BOS8 – Mike Richards – Signs with the Los Angeles Kings as requested by Upper Deck fans Chris Barr, Nick, Luke and Gene. BOS9 – Mike Modano – Retires as a member of the Dallas Stars as requested by Upper Deck fan Brian. BOS10 – Moment of Silence – Opening night shot on the moment of silence for the NHL players we lost during the offseason as requested by Upper Deck fans Luke, Matthew, Chris Valade, Guillaume Petit, Kyle Murphy, Gene, Jen, Ernest Hebert, Matthew Gilman, Nick Graff, Mike, Gordon Yet and Nick. Thank you to everyone who took part in that process to help us make this the best Biography of a Season set ever! We have also finished the design for the set and we think fans will love the high-end feel the cards will have this season. 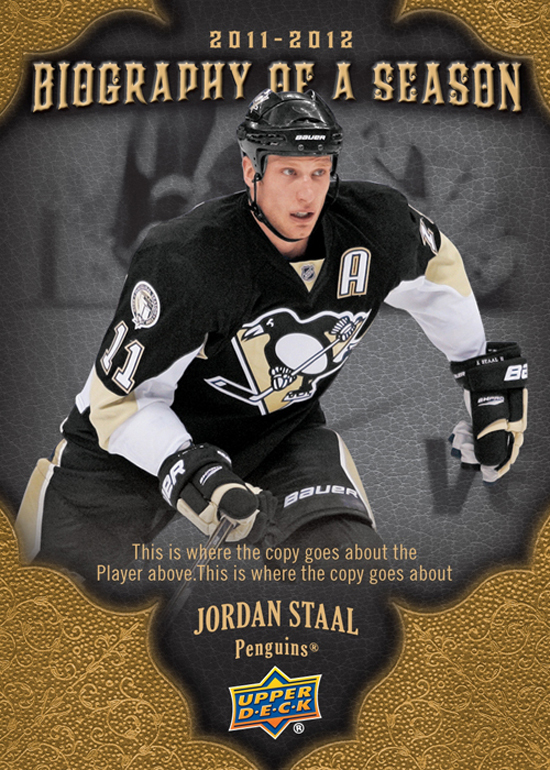 Take a look at this mock-up card of the design for the 2011-12 NHL Biography of a Season set (Note: Staal is used as an example and will not be included in the first series of ten cards). The design for this season's set gives the cards the look of an ornately decorated book which is appropriate since we are telling the story of the season. Unfortunately, due to a variety of issues, we will be unable to produce card #10 and it will be replaced with a card of the first game in Winnipeg.